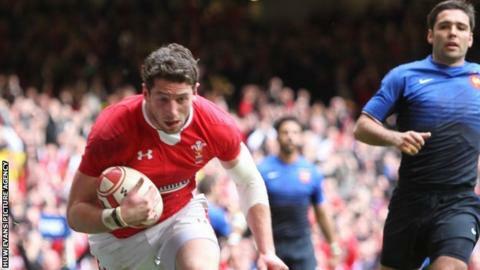 Grand Slam winner Alex Cuthbert has hit back at Jim Telfer's reported criticism that Wales' players are "lazy". Ex-Scotland and British and Irish Lions coach Telfer caused criticism by suggesting Wales' players had a lazy attitude. But wing Cuthbert dismissed Telfer's withering attack by saying he had worked hard to get into professional rugby. "It's his opinion, but I know how hard the boys work," he said. "We have shown in a lot of games where we come out on top as the fittest team, especially in last year's Six Nations, and hopefully we can show it again." Telfer told the Daily Mail: "Wales is not an easy country to coach because, basically, the Welsh are lazy. "Coaching them, playing against and with them, I realised they had reached the top because they were the cream and had not necessarily worked all that hard to get there." And expanding on those comments to the BBC Telfer said: "Until Warren Gatland got some of the forwards fit they didn't win as many games as they should have. "If you take Adam Jones for example when he is fit he is a very good player, but there has been a tendency in the past - front five players in particular- to be not so fit as they could be. "But once they do get fit they have got enough good rugby players to beat anybody in the world. "But they have to be very fit and sometimes they don't have that attitude." Cuthbert was responsible for scoring the try against France which sealed Wales' Grand Slam in 2012. "Everything we do [in preparation] is at a really high intensity to make sure we get as close as possible to that game standard." insisted the wing. "From where I started, and being in this environment, my game has really progressed. "I'm still developing and have a lot more to learn, but each game I will get more experienced." Cuthbert's views were backed up by Wales' Six Nations attack coach Mark Jones. "There is absolutely nothing lazy about the work ethic of the coaches or certainly the playing staff," said Jones. "Three Grand Slams in the last few years suggests being lazy isn't something that goes on here." Cardiff Blue Cuthbert is expected to be an integral part of Wales' bid for a winning start to their Six Nations campaign when they tackle Ireland at the Millennium Stadium on Saturday. Despite being just 13 caps into his Test career, the 22-year-old has carved a reputation as a prolific finisher and powerful runner with an impressive work-rate. "I try to set myself a target of 15 or more touches in a game," revealed Cuthbert. "Obviously, it's a high challenge to set, but we have got high expectations in the Wales camp and all the wingers and full-backs look to get as many touches as that. "Rob Howley [Wales interim head coach] gives us that licence to roam because we [George North and me] are big ball-carriers with good footwork. "We look to exploit those gaps for mismatches." Telfer also described English players as arrogant, prompting assistant coach Andy Farrell to suggest Telfer was merely attempting to boost Scotland ahead of the tournament.